The Summer Event on PS4 and Xbox One! Grab your powerboards and your floaters, because the Lohlunat Festival is coming to Risa! 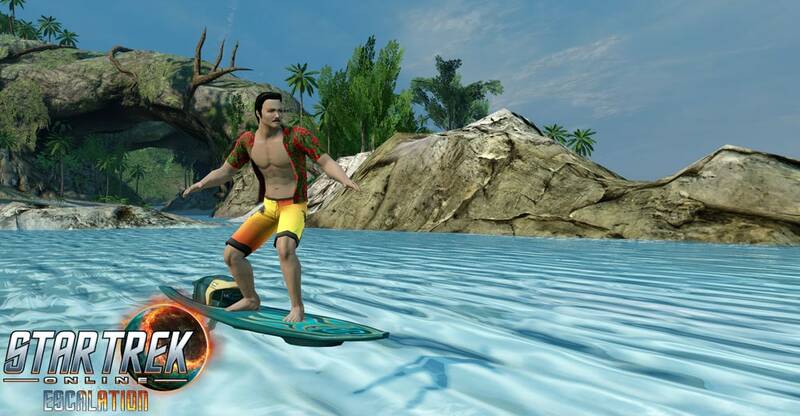 From June 8th at 9am PST to July 20th at 10AM PST, all the fun you’ve heard about will be available on Xbox One and Playstation 4 – dance parties, sand castle building, horga'hn hunts, powerboard racing and floater challenge courses – with new rewards (Tropical Caracals, TOS themed bathing suits, and a tropical tribble) and more. Please remember that swimsuits and shirts covered in horga'hns and dancing girls do not fall under the uniform code for members of the various exploratory and military services, and thus such items are non-regulation for mission duty. Qwen, an enterprising Ferengi, has set up a camp on the far side of the island where he is asking for help tracking down temporal anomalies that have popped up across the island. Feel free to contact him for more information. But be forewarned, he is in no way associated with the Risian resort! The Lohlunat Festival runs from June 9 to July 21. We'll see you there!